Objectives In long-term botulinum neurotoxin treatment, loss of therapeutic efficacy may occur due to neutralising antibody formation. Preliminary results with incobotulinumtoxinA, a preparation free of complexing/accessory proteins, have indicated a low antigenicity. We hypothesised that continuous treatment with this botulinum neurotoxin preparation would not result in an increase in neutralising antibody titres (NABTs) in patients with pre-existing NABTs. Design Prospective, blinded cohort study. Setting Single centre in Germany. Participants Thirty-seven cervical dystonia patients with NABTs and partial secondary non-responsiveness to their previous botulinum neurotoxin type A treatment. Intervention Three-monthly intramuscular injections of incobotulinumtoxinA with a constant dose of 200 MU per injection during the first year; thereafter up to 500 MU for the next 36 months. Outcome measures Primary outcome measure: number of patients in whom NABTs declined below the initial titre after 48 months of incobotulinumtoxinA treatment or in whom titres had become negative within the 48 months. Secondary outcome measure: steepness of changes in NABT. NABTs were determined by mouse hemidiaphragm assay. Findings were compared to long-term data from 24 cervical dystonia patients who had developed NABTs and in whom treatment had been discontinued. Results Following a transient increase in the first 24 months under incobotulinumtoxinA treatment in some patients, NABTs declined well below the initial titre in the majority of patients. Test assay results were negative in most of the patients followed for more than 36 months. NABTs seemed to decline into the negative detection range as rapidly under incobotulinumtoxinA treatment as after cessation of botulinum neurotoxin therapy. Conclusions The reduction of NABTs despite continuous treatment with incobotulinumtoxinA indicates low antigenicity of incobotulinumtoxinA. This might have implications on restrictions such as minimum injection intervals of ≥10 weeks currently in place for maintaining successful long-term application of botulinum neurotoxin. Evaluation of antigenicity of incobotulinumtoxinA, a botulinum neurotoxin type A preparation free of complexing proteins for the treatment of cervical dystonia. Secondary non-responders to conventional type A preparations showed a decline in neutralising antibody titres despite continuous treatment with incobotulinumtoxinA over a period of up to 50 months. Neutralising antibody titres seemed to decline into the negative detection range as rapidly under incobotulinumtoxinA treatment as after cessation of botulinumtoxin therapy. These results indicate low antigenicity of incobotulinumtoxinA. Till date, this study is the largest investigation of secondary non-responders with neutralising antibodies against botulinumtoxinA. The continuous treatment with incobotulinumtoxinA in secondary non-responders according to current knowledge of immunogenicity of botulinumtoxins should have resulted in boostering of antibody titres. Instead an unexpected decline of antibody titres was observed. This is an interesting finding despite the small sample size (n=37). Monocentric data have to be confirmed in multicentre studies. Intramuscular injections of botulinum neurotoxin (BoNT) have become the treatment of choice for the symptomatic therapy of focal dystonias;1 a recent evidence-based assessment gave a level A recommendation for the treatment of cervical dystonia (CD).2 Therapeutic BoNT type A (BoNT/A) preparations usually consist of a high-molecular-weight complex containing the biologically active 150 kDa neurotoxin, non-toxic complexing/accessory proteins and excipients.3 Repeated BoNT injections can trigger an immune response and can result in the formation of neutralising antibodies against the botulinum neurotoxin which might lead to non-responsiveness to treatment.4 To minimise this loss of therapeutic effect, it is recommended to avoid risk factors such as booster injections, the use of high doses and short intervals of less than 10–12 weeks between injections.5 Thus, optimal BoNT injection management leads to therapy restrictions in order to avoid secondary non-response. Current treatment recommendations reduce the frequency of secondary non-response to approximately 2% over a treatment period of 2 years in patients with cervical dystonia.6 However, a considerable percentage of patients would prefer shorter injection intervals and more individualised treatment.7 There is thus still a need for a BoNT preparation with an extremely low antigenicity to avoid therapy restrictions and meet patients’ needs. The new BoNT/A preparation free of complexing proteins seems to be such a candidate. IncobotulinumtoxinA (Xeomin, NT 201, Merz Pharmaceuticals GmbH, Germany) treatment has been proven efficacious and well tolerated in patients with CD8–10 and preliminary results also indicate a low antigenicity.3 ,11–13 The present study was designed to support these hints of low antigenicity. We hypothesised that continuous treatment with incobotulinumtoxinA would not result in an increase in neutralising antibody titres (NABTs) in patients with pre-existing NABTs. To test our hypothesis, we prospectively analysed NABTs in an immunologically critical subgroup of patients with NABTs and partial secondary non-responsiveness who were switched from long-term treatment with other botulinumtoxin A preparations to incobotulinumtoxinA treatment. Thirty-seven adult patients suffering from idiopathic CD partly in combination with other focal or generalised dystonia had been satisfactorily treated long term with the BoNT/A preparations abobotulinumtoxinA (Dysport, Ipsen Ltd., Slough, UK) or onabotulinumtoxinA (Botox, Allergan Inc, Irvine, California, USA). They were included in this prospective, blinded, monocentric study (1) when clinically secondary non-responsiveness with systematic worsening of the severity of cervical dystonia occurred—severity was measured by means of the objective TSUI score14 (12 weeks after injection) at three consecutive injection visits over a period of at least 6 months despite increased BoNT/A doses and (2) when patients had given their informed consent to be switched to incobotulinumtoxinA. IncobotulinumtoxinA was administered as intramuscular injections of 200 MU without electromyography guidance every 3 months according to their previous BoNT/A injection protocols. IncobotulinumtoxinA doses were kept constant during the first year; thereafter, doses could be adjusted according to the patients’ requirements, reduced or increased up to 500 MU per injection. The study was carried out according to the Declaration of Helsinki and Good Clinical Practice. Blood samples for BoNT antibody testing were collected at the start of the study and in yearly intervals. Antibody titres were determined by an independent blinded contractor (Toxogen GmbH, Hannover, Germany) using the sensitive mouse hemidiaphragm assay for neutralising antibodies.15 Base10 logarithms are presented for all titres (log10 (NABT) (mU/ml)); the value of −1.3 was assigned to a negative test result. The upper limit of neutralising antibody detection in the mouse hemidiaphragm assay was 10 mU/ml (log10(10)=1), the lower limit was 0.1 mU/ml ((log10(0.1)=−1). The use of the logarithmic scale allows the comparison of NABTs over the broad range of titres between 10 and 0.1 mU/ml. The primary outcome measure of the study was the number of patients in whom NABTs declined below the initial titre after 48 months of incobotulinumtoxinA treatment or who had negative titre results within the 48 months. The steepness of changes in NABT was chosen as secondary outcome measure. This parameter turned out to be difficult to calculate, because the titre had dropped below the detection limit in too many patients. To test our hypothesis, the formation of neutralising antibodies in the present patient population was followed over a period of up to 50 months. 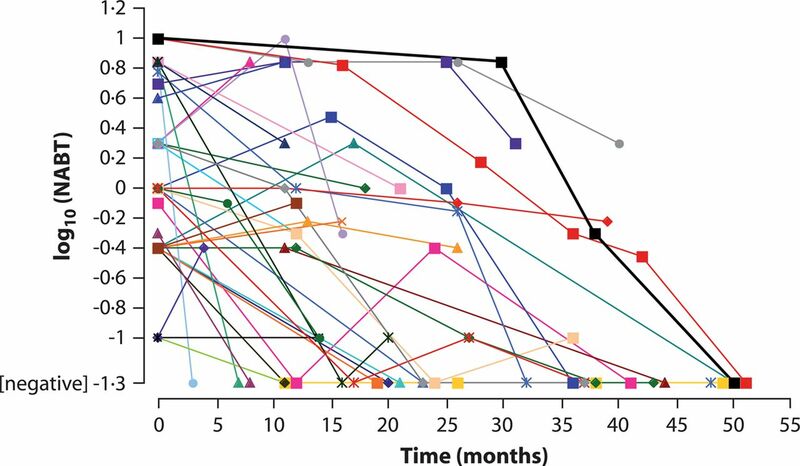 The temporal course of NABTs was compared to the course of NABTs of 24 CD patients who had their BoNT treatment discontinued after development of antibody-induced treatment failure. NABTs of 8 of these 24 patients have been described in the literature;16 the remaining 16 are follow-up patients from our centre. For quantification of the slope of NABT decline, patient data were divided into three groups. Group 1 included the titres of the 16 patients observed in our department with partial therapy failure who had their BoNT treatment discontinued. Group 2 were the NABTs of the 8 patients with complete therapy failure reported in the literature16 and group 3 included the titres of 37 patients with partial therapy failure who received continuous incobotulinumtoxinA treatment after positive NABTs were detected. The decline in NABTs was quantified by calculating a linear regression line through log10AB-titre values against time (log10(mU/ml)/year) for each patient. A negative titre was substituted by log10(0.01), because 0.1 is the next titre value below the detection limit of 0.1 mU/ml. For group comparisons, an ANOVA was performed (Kruskal–Wallis test), for group mean comparisons the non-parametric Mann–Whitney U-test was used. These tests are part of the commercially available statistics package SPSS. 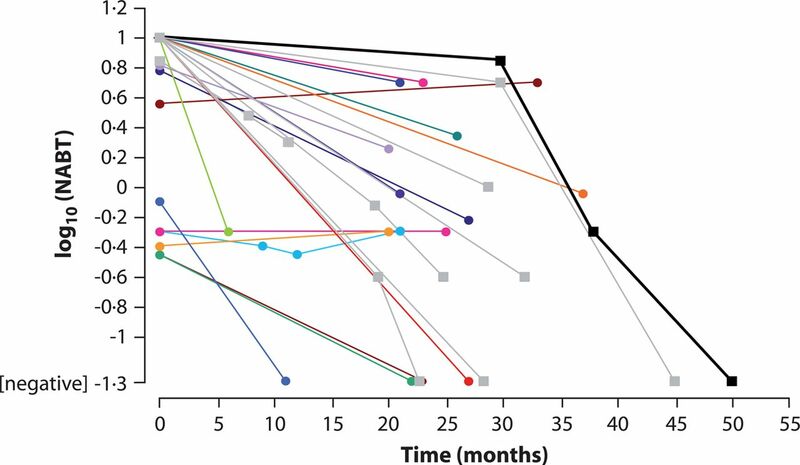 The two figures show the temporal course of NABTs over a period of up to 50 months in secondary non-responders who were either switched to incobotulinumtoxinA (figure 1), or did not receive any further BoNT treatment (figure 2). Decline in NABTs in 37 partial secondary non-responders (group 3) with cervical dystonia who were switched from their previous botulinum neurotoxin type A therapy to incobotulinumtoxinA treatment following the detection of neutralising antibodies. (coloured symbols ●, ▴, x, ▪, ♦) patients receiving incobotulinumtoxinA; (▪, bold line) data from one patient with cessation of botulinum toxin therapy were included as visual marker for comparison with figure 2. NABT, neutralising antibody titre. Decline in NABTs in 24 patients with cervical dystonia after cessation of botulinum neurotoxin type A therapy following the detection of neutralising antibodies. (▪) patients described in Dressler et al16, group 2 with complete therapy failure; (coloured ●) follow-up patients from our centre, group 1 with partial therapy failure; data of one patient (▪, bold line) were highlighted for comparison with figure 1. Please note that titre changes can only be presented for the time span when titres were within the detection limits of the mouse hemidiaphragm assay. NABT, neutralising antibody titre. Antibody titre values of one of the CD patients with cessation of BoNT treatment (figure 2) were included for a visual marker in figure 1 (symbol: black square, bold line). This patient had high titres (upper limit of detection); after a slow decline over the first 30 months, the neutralising antibody test was negative at the end of the 50-month observation period. Despite a transient increase in 10 patients in the first 24 months under incobotulinumtoxinA treatment (figure 1), NABTs declined well below the initial titre in the majority of patients (31 patients, 84%, p<0.001, χ2 test). Test assay results were even negative or below the lower detection limit in 23 (62%) of the patients in the follow-up, that is, antibody titres were ≤0.1 mU/ml. In figure 2 decline of titres is demonstrated for the patients in whom therapy was stopped (light grey squares=published patients, coloured circles own patients). There was considerable interindividual variability in the steepness of the titre decline in all three patient populations (figures 1 and 2). In most patients receiving incobotulinumtoxinA treatment (figure 1), baseline titres were lower than in the patients with discontinued treatment (figure 2). Under incobotulinumtoxinA treatment, antibody titres seemed to decline into the negative detection range as rapidly as after cessation of therapy and in some cases became negative even earlier than in those patients who had discontinued their BoNT/A treatment, probably because of lower initial titres. Mean slope of NABT decline (−0.0516 log10(mU/ml)/year) was lowest in the patients with partial therapy failure in whom BoNT treatment was discontinued after detection of positive NABTs (group 1). Variability of slopes was also highest in this group (minimum: −0.2168; maximum: 0.0048; SD: 0.6463). The NABTs reported in the literature for patients with complete treatment failure (group 2) declined rather homogeneously (−0.0664; minimum: −1.1620; maximum: −0.0348; SD: 0.2897). However, the mean slope for group 2 did not differ significantly from the mean slope for group 1 (p=0.12). The steepest mean slope of NABT decline (−0.0750) was observed in group 3 (minimum: −0.9484; maximum: 0.1505; SD: 0.1725). The Kruskal–Wallis test did not show any significant differences of slopes of NABT decline between the groups (p=0.269). Even when groups 1 and 2 were combined and slopes of patients with and without incobotulinumtoxinA treatment (group 3 versus groups 1+2) were compared, no significant difference could be detected (p=0.816). The patients included in our investigation had already developed secondary treatment failure and neutralising antibodies under the former treatment with botulinum toxin type A formulations containing complexing proteins. Despite their sensitivity to react to BoNT/A treatment with antibody formation and despite a possible increase of doses up to 500 MU incobotulinumtoxinA, more than 80% of these patients showed a decrease in antibody titres and in more than 60% a reduction down to the detection limit was observed. The antigen load of repetitive injections with 200–500 MU incobotulinumtoxinA every 3 months was apparently so low that in this cohort of immunologically critical patients no permanent boostering of antibody titres was observed. This confirms our hypothesis. We do not know whether this occurs because the low protein load of 0.88–2.2 ng (200–500 MU) of active neurotoxin is not detected by the human immune system after intramuscular injections or because of the lack of complexing proteins. The role of complexing proteins regarding the efficacy of treatment in secondary non-responders with BoNT/A is still unclear but deserves further interest. Since NABTs under incobotulinumtoxinA treatment declined at least as rapidly as after cessation of therapy, we recommend to detect antibody-induced therapy failure as early as possible to avoid any further increase in NABTs and development of complete treatment failure. Comparison of figures 1 and 2 indicates the tendency that in patients with partial therapy failure (groups 1 and 3) titres return to negative values earlier than in patients with complete therapy failure and higher antibody titres (group 2). The present data show that NABTs did not increase by incobotulinumtoxinA treatment and we also present evidence that the decline in NABTs was not significantly different in patients who were continuously treated with incobotulinumtoxinA following partial therapy failure with other BoNT preparations compared with patients who no longer received BoNT treatment after NABTs were detected. The present study has a potential impact on patient management. If it is confirmed in additional studies that the antigenicity of incobotulinumtoxinA is as low as suggested here—it has to be kept in mind that the presented data were produced in an uncontrolled, non-randomised study from a single centre—injection intervals and dosages can possibly be modified to meet patients’ need for an optimised individual treatment. Neutralising antibody assays were carried out by Toxogen GmbH, Hannover, Germany. Editorial assistance was provided by Elke Grosselindemann (Brett Medical Writing Australia).
. Botulinum toxin in clinical practice. J Neurol Neurosurg Psychiatry 2004;75:951–7.
. Assessment: botulinum neurotoxin for the treatment of movement disorders (an evidence-based review). Report of the Therapeutics and Technology Assessment Subcommittee of the American Academy of Neurology. Neurology 2008;70:1699–706.
. Content of botulinum neurotoxin in Botox®/Vistabel®, Disport®/Azzalure®, and Xeomin®/Bocouture®. Drugs R D 2010;10:67–73.
. Meta-analysis of neutralizing antibody conversion with onabotulinumtoxinA (BOTOX® ) across multiple indications. Mov Disord 2010;25:2211–18.
. Botulinum toxin drugs: future developments. J Neural Transm 2008;115:575–7.
. Long-term treatment with botulinum toxin type A in cervical dystonia has low immunogenicity by mouse protection assay. Mov Disord 2008;23:1353–60.
. Results of a multi-national patient and physician survey on treatment satisfaction with current botulinum toxin treatment in focal dystonia. Mov Disord 2010;25(Suppl 2):S511 (abstract 980).
. A new botulinum toxin type A free of complexing proteins for treatment of cervical dystonia. Neurology 2005;64:1949–51.
. Efficacy and safety of incobotulinumtoxinA (NT 201, XEOMIN® ), botulinum neurotoxin type A, without accessory proteins) in patients with cervical dystonia. J Neurol Sci 2011;308:103–9.
. Safety and efficacy of repeated NT 201 (botulinum neurotoxin type A free from complexing proteins) injections of patients with cervical dystonia: a first long-term safety analysis. Mov Disord 2010;25(Suppl 2):S237 (abstract 153).
. Botulinum neurotoxin type A free of complexing proteins (Xeomin® ) in focal dystonia. Drugs 2007;67:669–83.
. Complexing proteins in botulinum toxin type A drugs: a help or a hindrance? Biologics 2010;4:325–32.
. Follow-up of neutralizing antibody titers after continuous treatment with a BoNT/A preparation free from complexing proteins in patients with dystonia and secondary non-response to other BoNT/A preparations. J Neurol Sci 2009;285(S1):S299.
. Double-blind study of botulinum toxin in spasmodic torticollis. Lancet 1986;2:245–7.
. Botulinum A toxin therapy: neutralizing and nonneutralizing antibodies—therapeutic consequences. Exp Neurol 1997;147:96–102.
. Botulinum toxin antibody type A titres after cessation of botulinum toxin therapy. Mov Disord 2002;17:170–3.
. Botulinum toxin for treatment of dystonia. Eur J Neurol 2010;17(Suppl 1):88–96.
. Antigenicity differences between two brands of botulinum toxin A. Mov Disord 2010;25(Suppl 2):S227 (abstract 125). Contributors Study design, data collection, analysis and interpretation were carried out by all authors. HH prepared the first draft of the manuscript; all authors participated in the final preparation of the manuscript and approved the final version. Funding All costs associated with the publishing of the present manuscript were met by Merz Pharmaceuticals GmbH, Frankfurt, Germany. Merz Pharmaceuticals also paid for the neutralising antibody assays. Merz Pharmaceuticals was not involved in study design, data collection, and data analysis and interpretation. The authors were independent from the funder; they had full access to all presented data and take responsibility for all data and analyses. Competing interests HH participated in research studies for which unrestricted grants were provided by Allergan, Merz and Ipsen. He has been the recipient of honoraria and fees for presentations at meetings and conferences and for participating in Advisory Boards from Allergan, Ipsen and Merz. MM and UK received honoraria and fees for presentations at meetings and conferences. CH has nothing to declare and HB is shareholder and CEO of Toxogen GmbH, a spin-off of Medical School Hannover. Ethics approval The local ethics committee was asked and agreed on the continuation of botulinumtoxin treatment with the new preparation, incobotulinumtoxinA, as a possible treatment option. Usually the recommendation for secondary non-responders is to stop botulinumtoxin treatment.